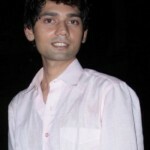 Ali Merchant, Sara’s BF entered the house yesterday to confront his GF and to save his sinking love relation. Ali will spend a week as a guest in the Bigg Boss house to sort his love life with his 3-year old fiancé or wife according to some news channels. Poor guy I think had enough and must have begged channel to let him in the BB house. As he was on the brink of losing his GF. But after the yesterday’s episode where Ashmit-Veena romance was on full swing, the massages, the cuddles, kisses and hugs, should be a eye opener for Sara Khan. After all she has witnessed everything from the secret room. Sara made mockery of herself and disturbed Ali by tearing his photographs, confessing her love to Ashmit, throwing herself on Ashmit and being a full time Bai to him. She will soon realise that Ali is the best available option to her, at least he will not make her MMS. Today’s episode will be a fun to watch, who confronts who? Ali to Ashmit or Sara to Veena and Ashmit both? Tashan hai bhai! I hope Ali and Sara get back together and drink-smoke happily ever after.